Released to critical acclaim earlier this year, Fedde’s first album for 6 years, ‘Something Real’, reaffirmed the fundamental truth that the best things in life are always worth waiting for. 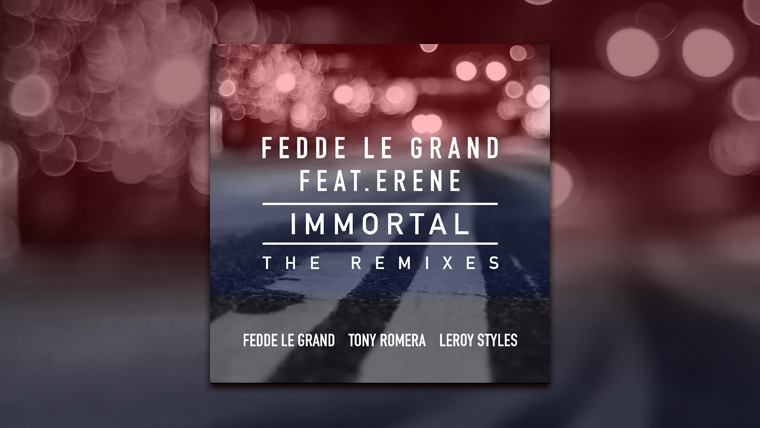 Now Fedde has called upon two producers to throw their hats into the remix ring for his album highlight, ‘Immortal’ featuring Erene. First up is French DJ Tony Romera, who exploded onto the scene four years ago with his unique style of French-house inspired beats. Taking the track into darker, more dubstep-esque realms, Romera injects ‘Immortal’ with a new energy and intensity. Dutch dance legend Leroy Styles steps up next, and takes thing in a different direction with his tribal house refix. Running more parallel to the original but still creating a new soundscape, Leroy cuts up the vocal and lays it over a funky four to the floor kick and syncopated bass line. Also added to the mix is an acoustic take on ‘Immortal’, something rarely seen on dance remixes packages. Stripping the original down to a guitar, vocal, strings and drum kit, Fedde gives the track a new texture, that is both musically interesting, and ethereal in nature.